Pharmaceuticals commonly found in the environment are disrupting streams, with unknown impacts on aquatic life and water quality. So reports a new Ecological Applications paper, which highlights the ecological cost of pharmaceutical waste and the need for more research into environmental impacts. Lead author Dr. Emma Rosi-Marshall, a scientist at the Cary Institute of Ecosystem Studies, comments: "Pharmaceutical pollution is now detected in waters throughout the world. Causes include aging infrastructure, sewage overflows, and agricultural runoff. Even when waste water makes it to sewage treatment facilities, they aren't equipped to remove pharmaceuticals. As a result, our streams and rivers are exposed to a cocktail of synthetic compounds, from stimulants and antibiotics to analgesics and antihistamines." 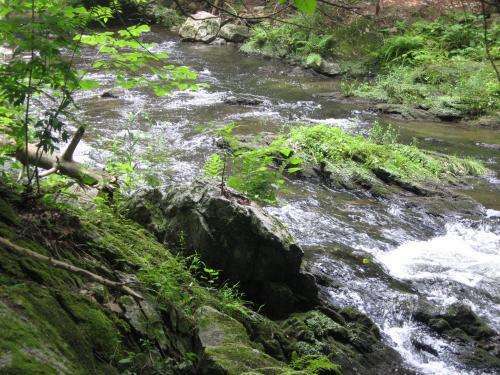 With colleagues from Indiana University and Loyola University Chicago, Rosi-Marshall looked at how six common pharmaceuticals influenced similar-sized streams in New York, Maryland, and Indiana. Caffeine, the antibiotic ciprofloxacin, the antidiabetic metformin, two antihistimines used to treat heartburn (cimetidine and ranitidine), and one antihistamine used to treat allergies (diphenhydramine) were investigated, both alone and in combinations, using pharmaceutical-diffusing substrates. Rosi-Marshall explains, "We focused on the response of biofilms – which most people know as the slippery coating on stream rocks – because they're vital to stream health. They might not look like much to the naked eye, but biofilms are complex communities composed of algae, fungi, and bacteria all living and working together. 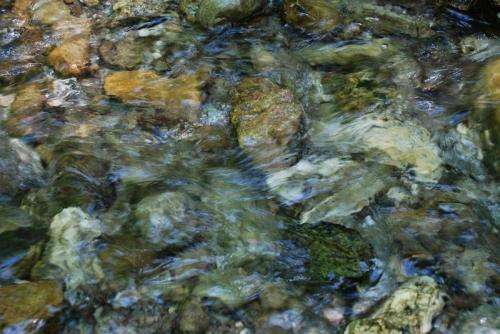 In streams, biofilms contribute to water quality by recycling nutrients and organic matter. They're also a major food source for invertebrates that, in turn, feed larger animals like fish." Healthy streams are slippery streams. And it turns out that antihistamines dry more than our noses. The most striking result of the study was diphenhydramine's effects on algal production and microbial respiration. Exposure caused biofilms to experience up to a 99% decrease in photosynthesis, as well as significant drops in respiration. 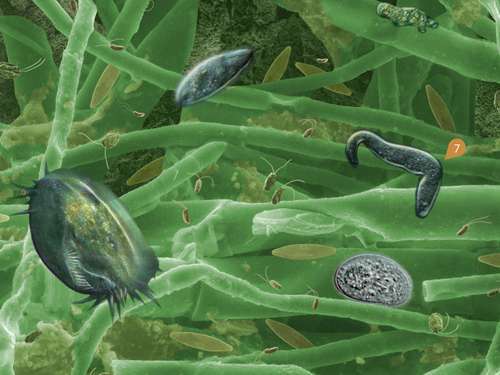 Diphenhydramine also caused a change in the bacterial species present in the biofilms, including an increase in a bacterial group known to degrade toxic compounds and a reduction in a group that digests compounds produced by plants and algae. Results suggest that this antihistamine is disrupting the ecology of these sensitive biofilm communities. Rosi-Marshall notes, "We know that diphenhydramine is commonly found in the environment. And its effect on biofilms could have repercussions for animals in stream food webs, like insects and fish. We need additional studies looking at the concentrations that cause ecosystem disruption, and how they react with other stressors, such as excess nutrients." The other pharmaceuticals investigated also had a measurable effect on biofilm respiration, both alone and in combinations. More work is needed to understand how drug mixtures, which most natural streams experience, impact freshwater systems. Society's dependence on pharmaceuticals is not likely to wane. Nor is its need for clean, fresh water. This study adds another piece of evidence to the case calling for innovations in the way we manage waste water. Currently, only a fraction of the world's waste water is treated, and the infrastructure in many developed nations is aging. What can be done about this? I understand only a fraction of the world's waste water is treated...Is that the only solution, building more waste water treatment plants? Do the waste water treatment plants currently in operation get the pharmaceuticals out of the water? Many people flush old meds down the toilet...Is disposing of them in the garbage (solid waste) any better for the environment? Thank you in advance for any information you can share regarding this serious problem! It is very bad news indeed if we are damaging biofilms and the sensitive ecosystems that are our rivers! Ultimately this will hurt us all! Probably the only way to get all the pharmaceuticals out of water would be distilling the water. But then you'd end up with a toxic solid waste precipitate which would need to be disposed of, probably in some underground storage facility, which would become absurdly costly over the long term. The article itself presents a solution, which is the obvious fact nature itself already has microbes which break this stuff down. Maybe make some sort of tanks, above and beyond existing treatment plants, where you can culture the microbes which eat these chemicals before you release it into the environment. Where do you get the microbes? Just look around where they live now in the wastewater.